Michael Grade is to step down as chief executive of ITV by the end of 2009 to become non-executive chairman. Mr Grade said he would leave the executive role at the conclusion of regulatory reviews into advertising contract rights and digital television. He said the outcome of the reviews would lead to major strategic decisions for ITV, which a new boss should make. In a letter to employees, Mr Grade said he was confident of handing his successor a "revitalised ITV". ITV said it hopes to appoint a new boss "as soon as practicable". 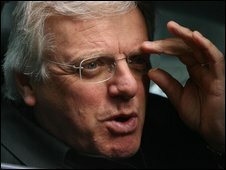 Mr Grade left his role as chairman of the BBC to join ITV in November 2006. He took on both jobs of chief executive and chairman, after chief executive Charles Allen left the company in August 2006. His original intention was to relinquish his executive responsibilities by the end of 2009. In February last year, at the request of the board, he agreed to extend his term as executive chairman until the end of 2010. However, he now says ITV is in a better position. "In February 2008... the new executive team had just been put in place, there was much uncertainty around the regulatory process and therefore continuity was paramount," he said in his letter. "Just over a year on, the team is firmly in place and performing so well." However, speaking to the BBC's business editor Robert Peston, Mr Grade said ITV had never faced tougher market conditions. Media commentator Steve Hewlett said ITV needs a new big idea. One possibility is that it could be split in two, with its content division separated from its broadcasting division. "When ITV was a bid target, all the venture capital companies and others who looked at it concluded that it would be better off as two businesses rather than one," Mr Hewlett told the BBC. "That theory has never gone away." Michael Grade had always been against this idea but a lot of people in the City think it should happen, he said. "This is really about opening the door to a new strategy for ITV," he added. Attention is turning to who will succeed Michael Grade at ITV. Sir Crispin Davis, chief executive of the publisher Reed Elsevier, is rumoured to be one contender. But there will also be a number of internal candidates, according to the BBC's media correspondent Torin Douglas. John Cresswell, currently chief operating officer at ITV, and Rupert Howell, managing director of brand and commercial operations, could be in the running, our correspondent says. ITV's director of programmes, Peter Fincham, who resigned as controller of BBC One after a scandal over footage of the Queen, could be another contender, he adds. ITV, which has been hit hard by an advertising slump, also said it was taking measures to improve the strength of its balance sheet. It is going to sell its SDN business, which leases space on Freeview, and said it had agreed terms for financing to raise a further £58m. Shares in ITV were down 3.9% in early trading. It added that it had no current plans to sell shares to investors in a rights issue despite speculation to the contrary. In March ITV reported a loss of £2.7bn for 2008 after a huge write-down in the value of its assets, and said it was cutting 200 jobs across its businesses.